MarinAire Pumps stand at the extreme edge in the field Hi-Tech Magnetic Pumps. MAP series pumps designed to pump fresh water, salt water, highly corrosive chemicals and solutions. 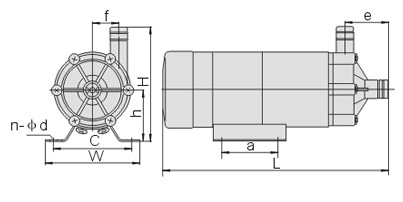 MAP series feature leak proof, seal-less magnetic drives and are designed for in-line, non-submersed use. They have a unique design with stylish appearance. In particular, it's bearing adopt ceramic material with special formula featuring strong resistance to abrasion and corrosion. MAP series also feature low power consumption, low starting current and high energy efficiency. Exactly what I expected. Just as advertised. Fast shipper. Excellent communication.